Advantages: Excellent drawings, details. Coloured drawings of squadron markings, including those of the Luftwaffe and Vichy France. Excellent bibliography. During the terrible Spring of 1940, the French Assault Group threw their Breguet 693s into the battle and faced the heavy German Flak and the ever-present Bf109 protecting the Panzer columns. Breguet crews faced their duty proudly. Several were lost during operations, mainly because their tatics which was not suited to the modern war. Most mission were flown without fighter cover and often they had to face both Flak and enemy fighters. "For them it was Le Sacrifice". Written by Olivier Ledermann & Jean-François MEROLLE and published by IPMS-France, this book is dedicated to the memory of the forgotten French aviators of this stage of the war. The book describes the pre war situation very well, and why there was no other way for France than falling after only two months of battle. 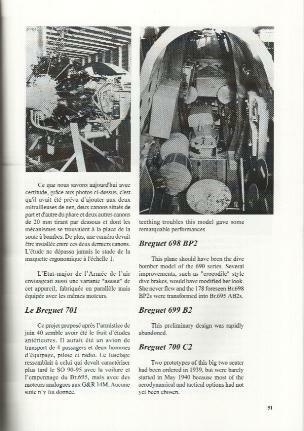 The story of the Breguet 690 family, which was the main workhorse of Assault Group, is also well documented. Many unpublished pictures are included. Also, the history of each GBA (Groupe de Bombardement d'Assault) is explained. It describes the hopes and courage of crews and the conditions in which they had to fight. It contains 200 pages, more than 180 photos, 3 maps, many 1/72 and 1/48 plans and colour profiles and it's written both in French and in English. Highly recommened for all those who are interested in the WW2 French Aviation. 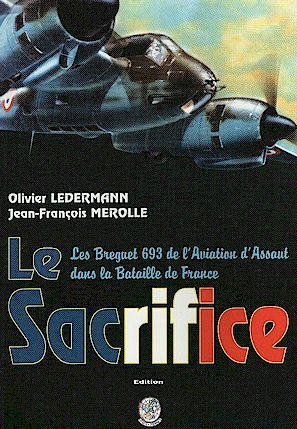 More than a pictural history of the Breguet 693, it's a real analisys of the French Air Force and the French aeronautical industry before and during the Battle for France. This book has got the 1995 Historical award of the "Aeroclub de France"
"Olivier LEDERMANN and Jean-François MEROLLE, IPMS-France Paris France 1994.196 pages, lots of photos and black & white and colour drawings, dual French and English text.Subtitle Les Breguet 693 de l&rsquo;Aviation d&rsquo;assaut dans la bataille de France, this handsome book is a study of the 693 and its near cousin in their various forms and squadrons, as they fought the Nazis. This account starts with the end of WWI and the efforts to rearm. The type 690 was designed, and grew rapidly into a whole series of these handsome twin-fin, twin-rudder attack bombers. Excellent drawings, details. Coloured drawings of squadron markings, including those of the Luftwaffe and Vichy France. Excellent bibliography. A quality publication by dedicated enthusiasts. (Sky Ways n°35 Jul.1995)"
Price 250 FF plus shipping.